For many people, pocket notebooks are synonymous with the brand *Field Notes*. But as much as we all love Field Notes for the style and utility, the paper performance can be less than desirable for fountain pen users. I recently tried a new notebook from Back Pocket notebooks in the UK. These journals are not only gorgeous but may be the perfect pocket notebook for fountain pen enthusiasts. Back Pocket Notebooks is a small notebook maker from England. They produce a series of Space X notebooks that have been on my radar for a while. Unfortunately, international shipping from the UK is expensive, and I could never bring myself to pull the trigger on a purchase. I finally bit the bullet on a purchase from Nero’s Notes, despite the International shipping cost and was very happy to find that they are also a distributor of Back Pocket notebooks. I added a set of both the Space X and the Guitar themed notebooks they make to my order, as I have not yet found a Back Pocket distributor on this side of the Atlantic. 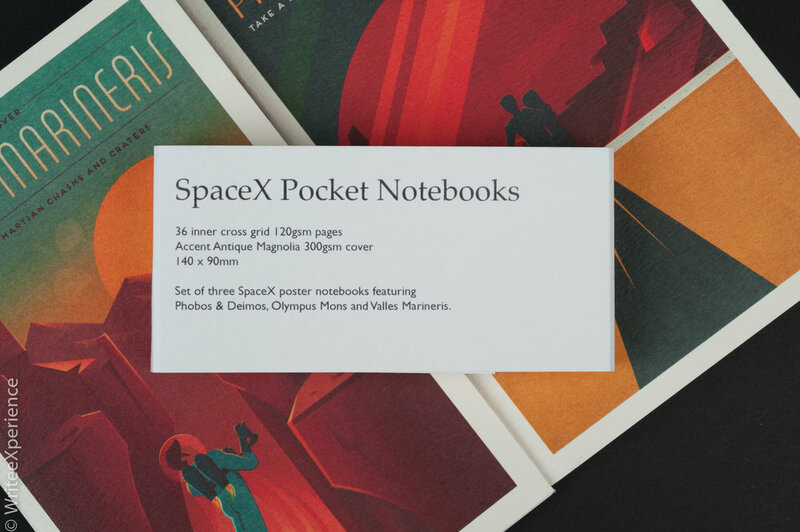 The Space X books are a set of three pocket notebooks based on artwork commissioned by Elon Musk for the Space X program and then promptly given away for free use. The artwork, depicting scenes of life on Mars, is terrific - echoing back to the trashy Science Fiction novels of my childhood. Back Pocket put these freely licensed designs to great use on attractive notebooks. Each of the three books has a different cover - featuring a unique picture and title: Phobos & Deimos; Olympus Mons and Valles Marineris. The images represent a futuristic yet retro-styled poster depicting tourists in a specific region of Mars, and it’s moons. These covers are printed in full colour but have a matte finish, which adds to the vintage feel. The inside cover of each notebook relates a story of the cover design and the inside back cover has a printed list of Universal Constants - idea information for the Mars tourist that needs to calculate the next ride back to earth. The Space X notebooks are pocket-sized notebooks that are the same size as the more common (in North America) Field Notes. They are staple bound and do feel more substantial than competing pocket notebooks. The covers are a heavyweight 300 gsm card stock. The inside writing paper is a heavier weight than most other pocket notebooks, using 120 gsm paper. For comparison, the latest Field Notes release, Three Missions, is printed on a 60# paper which is only 90 gsm. 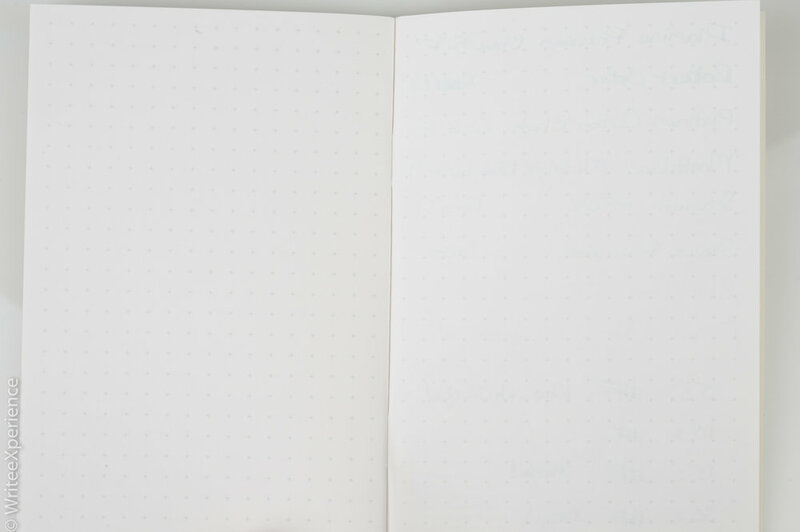 The notebooks contain 36 sheets of paper, which translates to 72 sides and the inside is printed with a dot grid format in a light grey colour. This choice is excellent for writing and general use but seems to disappear if you are used to darker dots. The thicker paper means that this is the first pocket notebook that has performed well with all the fountain pen ink I threw at it. I am a little reserved to call it fountain pen friendly, as I am sure someone with a double-broad firehose could find fault with the paper, but I think this is the most fountain pen friendly pocket-sized notebook that I have used. I tried a variety of pens and pencils into this notebook and was pleased with the results. The paper performance was outstanding for a pocket notebook. With fountain pens, there was no bleed and little show-through - which would allow you to write on both sides of the paper with little concerns. Ink dried quickly, and the only smudge I could make was with a 1.1 stub nib and a flowing and wet Robert Oster ink at 15 seconds. A fine nib dried with no smudging at 5 seconds! The paper writes smoothly. Not as smoothly as, say, a Rhodia coated paper, but smooth enough for comfortable writing. There is also enough texture to allow the use of pencils and ballpoint pens. I did get a tiny amount of smear using a Swiss Wood pencil, but a Blackwing pencil was fine. Look closely at the tests in the pictures for more details and also note the lack of bleed-through. I am sure you will be as impressed as I am. The page on the right is the back of the above written page. Minimal bleed! The only possible improvement that I would recommend for Back Pocket is that I would prefer the corners of the book to be rounded. These are straight cut, and I foresee damage through use as the books go in and out of your back pocket. This is a small detail, but hopefully something I will see on reorders. I really enjoyed the styling and design of the Back Pocket notebooks. I appreciate being able to use my wetter fountain pen nibs on the paper and like the design. If you can make an order large enough to offset the shipping costs from the UK, I would recommend adding a set of these notebooks to your collection.